Before I get into today’s topic today I wanted to give a quick update on the blog and podcast – if you sign-up for my monthly newsletter you’ll always have the inside scoop, so I encourage you to do that but I do want to share it with my podcast listeners in case you don’t follow the blog. I’m going to have podcasts out on only the 2nd and 4th Tuesday’s of the month. I’ll have blog posts out on the 1st and 3rd, and I’m leaving those 5th weeks that pop up in the month open right now. I thought if I kept all things on the same day it would make my planning and your listening and reading easier. This will give some time to catch up on past episodes if you haven’t got to listen in to them. I know the marriage series was hard for some of you because of the length of them, so I hope you’ll go back and listen in as you have time. I’ll link directly to that series in the show notes on this episode too. That was my favorite series to work on and record. It was such a blessing to my marriage, and I hope the Lord used it in many of yours too. How many times do we give thanks to the Lord for the ministry He has given us at home. Are we thankful for the mundane everyday moments or are we are only grateful when we think we are doing “great” things for the Lord? We live in God's home. He owns it. He has gifted it to us and given us the job of stewardship over it. He's put us in charge, and we are responsible to Him. As believers, it should make us work harder, and we shouldn't desire to escape from work or difficult situations because we know they are all with a purpose and we also know we are equipped to meet these situations in Christ. 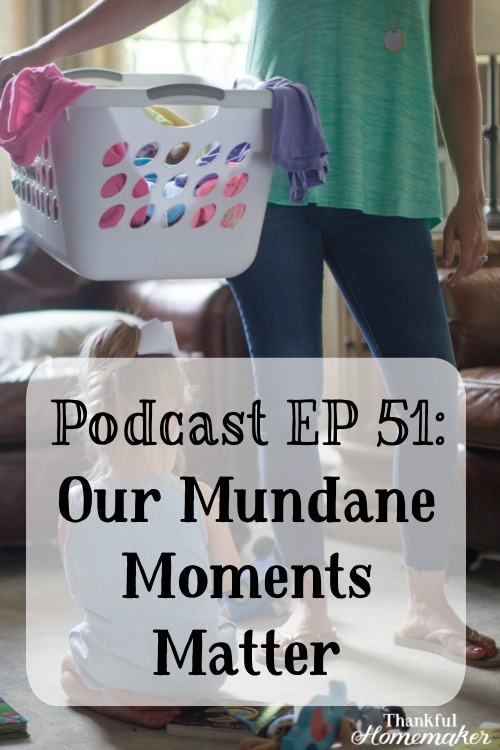 Mundane tasks are what make up most of our days. Everything matters —all of life is sacred. Once we’re in Christ, there is no separation of secular or sacred. Every moment is a holy moment that God has ordained. Do we think biblically about our time and what we see as these seemingly mundane tasks? We don’t see many photos on social media of people folding laundry or washing dishes—there’s no special medals or awards for these tasks. This is where we need to continually ask the Lord to gives us a mindset of remembering that the mundane matters. It's in these moments that He is growing us in holiness. I just found your podcast and this was the first one I listened to. I loved the quotes you mentioned. They are gold! I am really trying to challenge myself to meditate and memorize scripture and think about it as I do those mundane tasks through out the day. I know it takes a lot of energy and time.